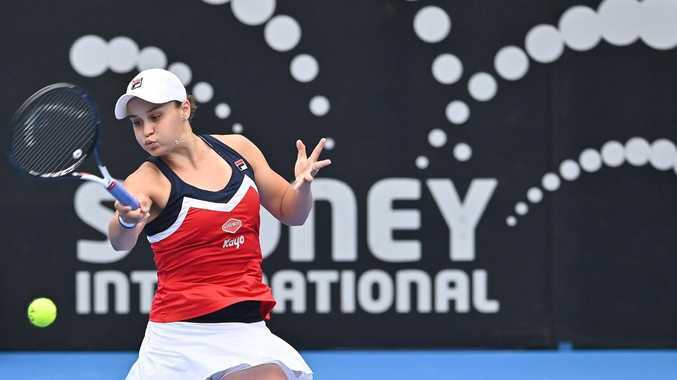 GIANT-killer Ashleigh Barty has stormed into her second successive Sydney International final after coming from a set down to beat world No.9 Kiki Bertens. It was Barty's third straight win over a player ranked above her, following victories over world No.1 Simona Halep and 12th-ranked Elise Mertens earlier this week. Barty, world No.15, will now face the winner of the semi-final between Petra Kvitova and Aliaksandra Sasnovich. "It's amazing, it truly has been a phenomenal week of tennis," Barty said. "I feel like I've played great the whole week, I've had tough opponents every single round and I'm really excited to have another shot at the title. "It would be amazing [to win]. "I think the last Australian female to win here was Mol (Alicia Molik) my Fed Cup captain, so I would love to try to be the next Australian. But I'll come out here tomorrow to enjoy it." The 22-year-old Australian prevailed 6-7 6-4 7-5 against her Dutch rival at Ken Rosewall Arena. Barty lost the first set after being 4-1 ahead in the tiebreak. Bertens reeled off six straight points to take the set. However, Barty broke Bertens at 3-2 in the second and eventually prevailed 6-4. In an absorbing third set, Barty broke Bertens to take a 6-5 lead and serve for the match. Barty went 40-0 up to earn three match points but only needed one, forcing Bertens into an error to claim her spot in the decider. "I missed my opportunity in the first set, I changed my mind a couple of times in that tiebreak and it cost me," Barty said. "I knew all I had to do was hang around and fight as hard as I could and try to change it to my favour. "I do always enjoy playing Kiki, she's an amazing girl off the court - probably more importantly than on the court - and she's a good friend of mine. "It's always tough playing your friends but I respect her and I know that she respects me. We can come out here and play hard, then look at each other in the locker room now like we haven't even played. "I feel like I'm continuing to develop, to grow as a player and I think that's the most important thing. "I'm playing with more freedom, I'm really enjoying myself and there's nothing better than playing in Australia. "Both Elise [Mertens] and Kiki [Bertens] were amazing opponents that I knew I had to be switched on and play my best tennis to win. "That's the best part of this tournament, it's so strong, every single round could be a final. So I have to be ready now and then I get to come out and enjoy tomorrow." Barty lost last year's Sydney final to Angelique Kerber, who last night was knocked out of the tournament by Kvitova.